Vince Carter is on set to discuss whether he’ll be suiting up for a record-setting 22nd season, why Trae Young grew as a player this year, and whether the Hawks will make the playoffs next season. DeMar DeRozan scores 29 points and Derrick White adds 23 as the Spurs take down the Hawks at home. Vince Carter sparks the Hawks ball movement for your Heads Up Play of the Day! An early-entry candidate selected as a junior out of the University of North Carolina by the Golden State Warriors in the first round (5th overall) of the 1998 NBA Draft ... Draft rights traded on draft night with cash considerations to the Toronto Raptors for the draft rights to Antawn Jamison (4th overall) ... Signed a multi-year contract with the Toronto Raptors (1/22/99) ... Signed a multi-year extension with the Toronto Raptors (8/3/01) ... Traded by the Toronto Raptors to the New Jersey Nets for Alonzo Mourning, Aaron Williams, Eric Williams, a 2005 first round draft pick and a 2006 first round draft pick (12/17/04) ... Re-signed with the New Jersey Nets to a multi-year contract (7/13/07) ... Traded by the New Jersey Nets with Ryan Anderson to the Orlando Magic for Rafer Alston, Tony Battie and Courtney Lee (1/25/09) ... Traded by the Orlando Magic with Marcin Gortat, Mickael Pietrus, a 2011 first round draft pick and cash considerations to the Phoenix Suns for Earl Clark, Jason Richardson and Hedo Turkoglu (12/18/10) ... Waived by the Phoenix Suns (12/9/11) ... Signed a multi-year contract with the Dallas Mavericks (12/12/11) ... Signed a multi-year contract with the Memphis Grizzlies (7/12/14) ... Signed a one-year deal with the Sacramento Kings (7/10/17). An eight-time NBA All-Star (2000-07) who has been voted in as a starter seven times and was the league’s leading vote-getter four times... Named to the the 1999-2000 All-NBA Third Team and 2000-01 All-NBA Second Team … Earned NBA Eastern Conference Player of the Month on three occasions in February 2005, December 2005 and April 2007 ... Received Eastern Conference Player of the Week 11 times ... The 1998- 99 NBA Rookie of the Year ... Selected to the 1998-99 NBA All-Rookie First Team ... Received NBA Rookie of the Month honors for March 1999 and April 1999 ... Won the Slam Dunk Contest at NBA All-Star Weekend in 2000. Averaging 18.2 ppg (.438 FG%, .374 3pt%, .799 FT%), 4.6 rpg, 3.3 apg, 1.1 spg, 0.6 bpg and 32.0 mpg in 1,347 games (969 starts) in 19 seasons with six teams: Toronto (1998-99—2004-05), New Jersey (2004-05—2008-09), Orlando (2009-10, 2010-11), Phoenix (2010-11), Dallas (2011-12—2013-14) and Memphis (2014-15—2016-17) … … Has 90 career double-doubles and five triple-doubles … Ranks 22nd on the NBA’s all-time scoring list with 24,555 career points… Became the 24th player in NBA history to break the 24,000 career points mark … Became the 37th player in NBA history to break the 20,000 career points barrier … Tied for fifth on the NBA’s all-time three-point field goals made list with 2,049 three-pointers… Became the fifth player in NBA history to reach 2,000 career three-pointers … Ranks 13th on the NBA’s career regular season games played list with 1,347 games … Became the 21st player in NBA history to appear in 1,300 career regular season games … Averaged at least 20 points per game in 10 consecutive seasons (1999-2009). Averaging 18.8 ppg, 5.6 rpg, 3.5 apg and 1.12 steals in 34.6 minutes in 82 playoff games (60 starts) for Toronto (1999-00, 2000-01), New Jersey (2004-05—2006-07), Orlando (2009-10), Dallas (2011-12, 2013-14) and Memphis (2014-15—2016-17). Averaged 8.0 ppg (.394 FG%, .378 3pt%, .765 FT%), 3.1 rpg, 1.8 apg, 0.8 spg, 0.5 bpg and 24.7 mpg ... As a starter, averaged 9.2 ppg (.446 FG%, .429 3pt%. .947 FT%), 3.3 rpg, 2.1 apg, 0.9 spg, 0.5 bpg and 28.5 mpg in 15 games ... As a reserve, averaged 7.7 ppg (.380 FG%, .363 3pt%, .729 FT%), 3.1 rpg, 1.8 apg, 0.8 spg, 0.5 bpg and 23.7 mpg in 58 games ... Missed a total of nine games… Did not play in one game due to a coach's decision (11/30/16) ... Did not dress in six games due to a right hip flexor strain (12/1-12/10/16) ... Missed one game due to a planned recovery day (2/8/17) ... Missed one game due to rest (4/2/17) ... Scored in double figures 26 times and had four games with at least 20 points … Led the Grizzlies in scoring twice, in assists five times, in steals 16 times, in steals 28 times, in blocks 16 times and in minutes once (all including ties) ... In his 19th NBA season, ranked as the oldest active player in The Association ... One of five players who began their NBA careers in the 1990s to play in 2016-17 (Dirk Nowitzki, Paul Pierce, Jason Terry and Metta World Peace) ... Became the 24th player in NBA history to score 24,000 career points ... Moved to 22nd on the NBA’s all-time scoring list after surpassing both Allen Iverson (24,368 poits, 24th all-time) and Ray Allen (24,505 points, 23rd all-time) ... Became the 21st player in NBA history to play in 1,300 regular season games ... Climbed into the top 20 in NBA history for career regular season games and topped Kobe Bryant for 13th all-time by season's end with 1,347 regular season appearances ... Passed Jason Kidd (1,988) for fifth in NBA history for career three-pointers made ... Became the fifth player in NBA history to reach 2,000 three-pointers made, finishing the sesaon with a career total of 2,049 … Made a total of 53 three-pointers after his 40th birthday, an NBA record previously held by John Stockton with 32 ... Became the oldest player at 40 years and 46 days old to knock down five threes in a game during his 24 point performance ... Became the sixth player in NBA history to score 20 points in a game at the age of 40, joining Michael Jordan, Kareem Abdul-Jabbar, John Stockton, Robert Parish and Karl Malone ... Became the first 40-year-old, at the age of 40 years and 46 days old, to score 24-plus points in a game since Michael Jordan had 25 on April 11, 2003 at the age of 40 years and 53 days old ... Became the oldest player in NBA history to score 20 points off the bench when he did so at 39 years and 287 days old eclipsing the previous record held by Michael Jordan (Nov. 26, 2002 at 39 years, 282 days) ... Broke his own record when he scored 20 off the bench at 39 years and 293 days old ... Became the fifth 40-year-old in league history to record four blocks in a game, joining Dikembe Mutombo, Kareem Abdul-Jabbar, Robert Parish and Karl Malone ... Finished the season with 10 dunks, his 18th season with double-digit dunks ... Top Single Game Performances: Recorded double-figuring scoring just three games in with an 18 point performance (5-6 FG, 5-6 3pt, 3-4 FT) in a win vs. Washinton (10/30/16) ... Posted 20 points (8-13 FG, 3-7 3pt, 1-2 FT), three boards, five assists and two blocks in a win vs. Denver (11/8/16) ... Totaled 20 points (6-11, 3-5 3pt, 5-6 FT) and seven rebounds in 31 minutes in a win at Utah (11/14/16) ... Notched 14 points, five boards and a season-high six assists in 26 minutes in a win at Denver (2/1/17) ... Blocked a season-high four shots and totaled seven points (3-9 FG, 1-5 3pt, 0-1 FT), six boards and two assists in a win vs. San Antonio (2/6/17) ... In his first start of the season, scored a season-high 24 points (8-8 FG, 6-6 3pt, 2-2 FT) and added five boards and three steals in a win vs. Milwaukee (3/13/17) ... Grabbed a season-high eight rebounds and scored 21 points (5-8 FG, 4-6 3pt, 7-7 FT) in 31 minutes vs. Indiana (3/29/17) ... Tied his season-high eight rebounds just one game later vs. Dallas (3/31/17). 2017 Playoffs: Averaged 9.2 ppg (.476 FG%, 8-20 3pt, 7-7 FT), 3.3 rpg, 1.5 apg, 0.3 spg and 32.5 mpg in six games (Six starts) ... Scored in double-figures four times ... Became the oldest player at 40 years and 91 days to start a postseason game since Dikembe Mutombo (41 years and 312 days) in 2008 ... Top Single-Game Postseason Performance: Scored 13 points (5-9 FG, 3-5 3pt) and added three rebounds and two assists in a playoff win vs. San Antonio (4/22/17) against the Thunder. Averaged 6.6 ppg (.388 FG%, .349 3pt%, .833 FT%), 2.4 rpg, 0.9 apg, 0.6 spg, 0.3 bpg and 16.8 mpg in 60 games (Three starts) in year 18 of his NBA career ... Missed a total of 22 games ... Did not play as a healthy scratch in 18 games due to coach’s decision (10/28-10/31/15, 11/3-11/16/15, 12/9-12/18-15, 1/4/16) ... Did not play in two games due to a coach’s decision while dealing with a left calf strain (3/12-3/14/16) ... Did not dress in two games due to a left calf strain (3/16/17, 3/17/16) ... Scored 10+ points 16 times ... Led the Grizzlies in scoring twice, in rebounding twice, in assists twice, in steals four times and in blocks nine times (all including ties) ... Surpassed Charles Barkley (23,757 points) for 24th in NBA history on the all-time scoring list and finished the season with 23,969 total regular points scored ... Made the longest shot in the NBA in over nine years when he swished an 83-foot shot ... Top Single-Game Performances: Recorded 16 points (4-8 FG, 2-4 3pt, 6-7 FT) and a season-high seven rebounds in a season-high 31 minutes at Toronto (2/21/16) ... Scored a season-high 19 points (7-10 FG, 5-7 3pt), with five 3s in the first half in a win at Los Angeles Lakers (2/26/16) ... Scored 15 points (4-9 FG, 2-4 3pt, 5-6 FT) as four of his made free throws came in the final 13.4 seconds to help guide his team to a win at Cleveland (3/7/16) … Posted 17 points (7-15 FG, 2-4 3pt, 1-1 FT), a season-high four assists, and five boards in a win vs. Chicago (4/5/16) ... Recorded 15 points (6-12 FG, 1-2 3pt, 2-2 FT), and tallied seven rebounds and four assists to match his season-highs vs. Golden State (4/9/16). 2016 Playoffs: Averaged 11.3 ppg (.455 FG%, .700 3pt%, 1.000 FT%), 3.8 rpg, 1.3 apg, 0.5 spg, 0.3 bpg and 22.8 mpg in four games (Four starts) ... Scored in double-figures three times ... Top Single-Game Postseason Performance: Scored a 2016 playoff-best 16 points (6-7 FG, 2-3 3pt, 2-2 FT) abd added three rebounds and two assists at San Antonio (4/17/16). Averaged 11.9 ppg (.407 FG%, .394 3pt%, .821 FT%), 3.5 rpg, 2.6 apg, 0.8 spg, 0.4 bpg and 24.4 mpg in 81 games (Zero starts) in his 16th year in The Association ... Scored 10+ points 51 times and 20+ points seven times ... Recorded one double-double ... Led the league in three-pointers made off the bench (146) ... Ranked 27th among league leaders in three-point percentage ... Became the 27th player in NBA history to eclipse the 23,000 career points mark ... Advanced from 27th to 25thon the NBA’s all-time scoring list to eclipse Elgin Baylor (23,149 points, 27th) and Adrian Dantley (23,177 points, 26th) as he finished the season with 23,190 total career regular season points ... Passed Steve Nash (1,685 3pt, 11th), Dale Ellis (1,719 3pt, 10th), Peja Stojakovic (1,760 3pt, 9th), and Rashard Lewis (1,787 3pt, 8th) to leap to 7thon the NBA’s all-time three-point field goals made list ... Made his 1,700th career three-pointer, just the 10th player in NBA history to accomplish that feat ... Knocked down his1800th career triple to become just the seventh player in league history with at least 1,800 three-pointers made as he ended the season with 1,809 ... Top Single-Game Performances: Scored 13 points (4-8 FG, 1-5 3pt, 4-6 FT) and five rebounds in 23 minutes on his 37th birthday in a win vs. Detroit (1/26/14) ... Scored 23 points (8-17 FG, 7-12 3pt) to set his season-high in a win at New York (2/24/14) ... Recorded his only double-double of the season with 12 points (4-13 FG, 2-5 3pt, 2-2 FT), 10 rebounds and four assists vs. Brooklyn (3/23/14) ... Matched his season-high points total with a 23 point effort (9-13 FG, 4-5 3pt, 1-2) vs. LA Clippers (3/27/14). 2014 Playoffs: Averaged 12.6 ppg (.456 FG%, .484 3pt%, .786 FT%), 3.6 rpg and 2.4 apg in 27.2 mpg in seven games (Zero starts) ... Scored 10+ points five times and 20+ points once ... Top Single-Game Postseason Performances: Scored 11 points (3-8 FG, 1-3 3pt, 4-4 FT) and drained a three-pointer from the corner as time expired to give Dallas a 109-108 victory in Game 3 of the Mavs opening round series vs. San Antonio (4/26/14) ... Recorded a game-high, a playoff-high, and a season-high 28 points (10-16 FG, 7-9 3pt, 1-2 FT) in Game 5 at San Antonio (4/30/14). Averaged 13.4 ppg (.435 FG%, .406 3pt%, .816 FT%), 4.1 rpg,, 2.4 apg, 0.9 spg, 0.5 bpg and 25.8 mpg in 81 games (Three starts) in his 15th NBA season ... Scored 10+ points 59 times and 20+ points 12 times ... Recorded one double-double ... Tied for 27th in three-point percentage among NBA leaders ... Made a team-high 162 three-pointers (15th in the NBA), tying his career high for 3s in a season (2000-01) ... Tied with Oklahoma City’s Kevin Martin for the most three-point field goals made off the bench (158) ... Made at least one three-pointer in each of the final 25 games of the season (March 1-April 17, 2013), a career-best streak within a single season ... That was also the longest such streak by a reserve in 2012-13 ... Ranked seventh among reserves in scoring (13.3 points off the bench) ... Over the course of the season, advanced from 17th to 11th on the NBA’s all-time three-point field goals made list, Eclipsed Nick Van Exel (1,528 3pt, 17th), Tim Hardaway (1,542 3pt, 16th), Eddie Jones (1,546, 15th), Glen Rice (1,559, 14th) , Jason Richardson (1,577, 13th) and Kobe Bryant (1,637, 12th) as he finished with 1,663 three-point field goals made ... Became the 104th player in NBA history to appear in 1,000 regular season games ... Surpassed Hal Greer (21,586 points, 31st), Larry Bird (21,791 points, 30th), Gary Payton (21,813 points, 29th), and Clyde Drexler (22,195, 29th) to jump to 27th on the NBA’s all-time scoring list ... Finished the season with 22,223 points to become just the 28th player in league history to eclipse the 22,000 points mark ... Recorded his 8,000th career field goal to become the 33rd player in league history to make at least 8,000 field goals ... Recorded his 4,000th career assist ... Became one of 15 players in NBA history with at least 22,000 points, 5,000 rebounds and 4,000 assists to join the likes of Kareem Abdul-Jabbar, Karl Malone, Michael Jordan, Kobe Bryant, Wilt Chamberlain, Oscar Robertson, John Havlicek, Alex English, Kevin Garnett, Jerry West, Paul Pierce, Charles Barkley, Ray Allen and Clyde Drexler ... Top Single-Game Performances: Recorded a season-high 29 points (10-17 FG, 5-7 3pt, 3-3 FT) as he made a go-ahead three-pointer with 6.5 seconds left in the fourth quarter in a 104-100 win at New Orleans (2/22/13) ... Posted 22 points (9-19 FG, 1-3 3pt, 3-5 FT), 12 boards and seven assists for his only double-double of the season in a win vs. Denver (4/12/13). Averaged 10.1 ppg (.411 FG, .361 3pt%, .826 FT%), 3.4 rpg, 2.3 apg, 0.9 spg, 0.4 bpg and 25.3 mpg in 61 games (40 starts) in his 14th season as an NBA professional ... Scored 10+ points 31 times and 20+ points four times ... Recorded one double-double ... Climbed to 31st on the NBA’s all-time scoring list as he passed George Gervin (20,708 points, 35th), David Robinson (20,790 points, 34th), Bob Pettit (20,880 points, 33rd), and Walt Bellamy (20,941 points, 32nd) and for a total of 21,135 points at the end of the season ... Became the 18th player in NBA history with 1,500 career three-point field goals made as he finished the season with 1,501 ... Top Single-Game Performances: Posted 18 points (5-15 FG, 3-7 3pt, 5-6 FT) and 12 rebounds for his only double-double of the year at Utah (4/16/12) … Recorded a season-high 23 points (8-18 FG, 1-6 3pt, 6-6 FT) in a win vs. Houston (4/18/12). 2012 Playoffs: Averaged 8.3 ppg (.293 FG%, .300 3pt%, .750 FT), 5.5 rpg, 0,3 apg 1.3 spg, 0.5 bpg and 26.8 mpg in four games (Zero starts) ... Scored in double-figures in one game ... Top Single-Game Postseason Performance: Posted 13 points (5-14 FG, 0-2 3pt, 3-4 FT) and seven rebounds at Oklahoma City (4/28/12). Averaged 14.0 ppg (.437 FG%, .361 3pt%, .740 FT%), 3.8 rpg, 2.0 apg, 0.9 spg, 0.3 bpg and 28.1 minutes in his 13th NBA season, split between Orlando and Phoenix ... Scored 10+ points 59 times, 20+ points 15 times and 30+ points twice ... Collected 10+ rebounds in two contests ... Notched five-plus steals in one game ... Recorded two double-doubles ... Traded by Orlando to Phoenix in a six-player deal on Dec. 18, 2010. 2010-11 (Phoenix): Averaged 13.5 ppg (.422 FG%, .366 3pt%, .735 FT%), 3.6 rpg, 1.6 apg, 0.9 spg, 0.3 bpg and 27.2 mpg in 51 games (41 starts) ... Top Single-Game Performances: Posted his first double-double with a 29 point (11-20 FG, 5-8 3pt, 2-2 FT) and 10 rebound effort in a win at New York (1/17/11) ... Recorded 12 points (5-17 FG, 1-4 3pt, 1-2 FT) and 10 rebounds for his second and final double-double of the season in a win at Washington (1/21/11) ... Scored a season-high 33 points (11-21 FG, 6-12 3pt, 5-7 FT) and grabbed six boards vs. Oklahoma City (2/4/11) ... Neared his season high with 32 points (13-17 FG, 5-7 3pt, 1-2 FT) and added six rebounds, three assists and three steals in a win vs. Houston (3/8/11). 2010-11 (Orlando): Averaged 15.1 ppg (.470 FG%, .346 3pt%, .747 FT%), 4.1 rpg, 2.9 apg, 0.9 spg, 0.1 bpg and 30.2 mpg in 22 games (22 starts) ... Top Single-Game Performance: Scored 25 points (10-15 FG, 2-5 3pt, 3-4 FT) and tallied four rebounds, nine assists, and three steals in a win at Detroit (12/3/10). Averaged 16.6 ppg (.428 FG%, .367 3pt%, .840 FT%), 3.9 rpg, 3.1 apg, 0.7 spg, 0.2 bpg and 30.8 mpg in 75 games (74 starts) in his 12th NBA season ... Scored 10+ points 60 times, 20+ points 25 times, 30+ points twice and 40+ points once ... Recorded one double-double ... Ranked 27th in the NBA in free throw percentage ... Top Single-Game Performances: Totaled 17 points (7-15 FG, 2-3 3pt, 1-3 FT), 10 rebounds and seven assists for his only double-double of the year in a win vs. Milwaukee (2/2/10) ... Recorded seven rebounds to go along with a season-high 48 points (19-27 FG, 6-10 3pt, 4-4 FT) in a win vs. New Orleans to become just the fifth player in Magic history to score at least 48 points in a game ... Dished out a season high eight assists and added 24 points (7-11 FG, 3-4 3pt, 7-8 FT) and four rebounds in a win vs. San Antonio (3/17/10). 2010 Playoffs: Averaged 15.5 ppg (.402 FG%, .235 3pt%, .826 FT%), 4.2 rpg, 2.3 apg, 0.9 spg, 0.2 bpg and 34.3 mpg in 14 playoff games (14 starts) ... Scored 10+ points 11 times and 20+ five times ... Top Single-Game Postseason Performances: Scored 21 points (7-16 FG, 1-5 3pt, 6-9 FT) and added three rebounds and four assists in a win at Charlotte (4/26/10) to help Orlando sweep the opening round series ... Totaled 24 points (9-16 FG, 2-5 3pt, 4-4 FT), seven rebounds, two assists, one steal and one block in a win vs. Atlanta (5/6/10) ... Notched 22 points (7-12 FG,4-7 3pt, 4-6 FT), four rebounds and three assists in a Game 4 win at Atlanta (5/10/10) that clinched an Eastern Conference Finals berth for Orlando ... Posted 17 points (6-15 FG, 1-4 3pt, 4-5 FT), seven rebounds and three assists at Boston (5/28/10). Averaged 20.8 ppg (.437 FG%, .385 3pt%, .817 FT%), 5.1 rpg, 4.7 apg, 1.0 spg, 0.5 bpg and a team-high 36.8 mpg in 80 games (80 starts) in his 11th NBA season ... Scored 10+ points 71 times, 20+ points 44 times, 30+ points 14 times and 40+ points once ... Recorded eight double-doubles and one triple-double ... Ranked 16th in the NBA in scoring, tied for 26th in minutes played and tied for 30th in assists ... Top Single-Game Performances: Totaled 39 points (17-28 FG, 3-7 3pt, 2-2 FT), nine rebounds and six assists and sent the game into overtime with a three-pointer after which he converted a game-winning, buzzer-beating reverse alley-oop at Toronto (11/21/08) ... Recorded 18 points (6-18 FG, 5-7 3pt, 1-2 FT), which included a game winning three-pointer from 33 feet out as time expired vs. Atlanta (1/2/09) ... Recorded a near triple-double with 23 points (8-14 FG, 1-4 3pt, 6-6 FT), nine rebounds and a career-high 14 assists at Milwaukee (1/9/09) ... Tied his career high of six steals and added 21 points (8-17 FG, 2-5 3pt, 3-4 FT), five rebounds and four assists vs. Oklahoma City (1/12/09) ... Recorded his only triple-double of the season with 15 points (3-12 FG, 1-3 3pt, 8-10 FT), 10 rebounds, and 12 assists in a win vs. Milwaukee (2/3/09) ... Scored a season-high 41 points (13-26 FG, 5-9 3pt, 10-10 FT) and tallied seven boards, six assists and two steals at LA Clippers (3/15/09). Averaged 25.2 ppg (.454 FG%, .357 3pt%, .802 FT%), a career-high tying 6.0 rpg, 4.8 apg, 1.0 spg, 0.4 bpg and 38.1 mpg as he appeared in all 82 games (82 starts) in his ninth NBA season ... Scored 10+ points 80 times, 20+ points 60 times, 30+ points 25 times and 40+ points six times ... Recorded 13 double-doubles and two triple-doubles … The only Nets player to appear in all 82 games ... Ranked eighth in the NBA in scoring, 17th in minutes played and tied for 28th in assists ... Broke the Nets single season points record, set by him the year before, after he scored 2,070 points during the season to become the only Nets player to date to eclipse the 2,000 points mark ... Named NBA Eastern Conference Player of the Month in April, after he averaged 29.0 ppg (.478 FG%, .407 3pt%, .871 FT), 7.1 rpg, 6.7 apg, 0.9 spg, 0.7 bpg and 39.4 mpg in nine games (Nine starts) ... Named an NBA All-Star for the eighth consecutive season ... Top Single-Game Performances: Totaled 37 points (14-30 FG, 9-20 3pt), eight rebounds, five assists and four steals as he set the Nets franchise records for both three-pointers made and three-pointers attempted in a win vs. Memphis (12/11/06) ... Recorded a season-high 46 points (15-25 FG, 4-10 3pt, 12-12 FT) in just 32 minutes and eight seconds of play vs. New Orleans-Oklahoma City (2/21/07) ... Posted a triple-double as he tied his season-high 46 points (16-28 FG, 7-13 3pt, 7-9 FT) and added 16 rebounds and 10 assists vs. Washington (4/7/07) ... Notched his second triple-double of the year with 29 points (7-14 FG, 3-5 3pt, 12-13 FT), 12 rebounds and 10 assists in a win at New York (4/16/07). 2007 Playoffs: Averaged 22.3 ppg (.396 FG%, .389 3pt%, .693 FT%), 6.8 rpg, 5.3 apg, 0.9 spg, 0.6 bpg and 40.6 mpg in 12 playoff games (12 starts) ... Scored in double-figures 12 times, 20+ points eight times and 30+ two times ... Grabbed 10+ rebounds twice ... Dished out 10+ assists in one game ... Recorded two double-doubles ... Top Single-Game Postseason Performances: Totaled 19 points (8-24 FG, 1-7 3pt, 2-4 FT), 11 rebounds, five assists and three steals at Toronto (4/24/07) ... Scored 37 points (15-23 FG, 2-4 3pt, 5-6 FT) in a win vs. Toronto (4/27/07) ... Recorded 30 points (10-22 FG, 4-7 3pt, 6-10 FT), five rebounds, two assists and a steal at Toronto (5/1/07) ... Collected a double-double with 21 points (7-23 FG, 1-6 3pt, 6-6 FT), 13 rebounds and six assists at Cleveland (5/6/07) ... Notched 25 points (6-23 FG, 3-6 3pt, 10-14 FT), nine boards and nine assists for a near triple-double vs. Cleveland (5/14/07). Averaged 24.2 ppg (.430 FG%, .341 3pt%, .799 FT%), 5.8 rpg, 4.3 apg, 1.2 spg, 0.7 bpg and 36.8 mpg in 79 games (79 starts) in his eighth NBA season ... Scored 10+ points 75 times, 20+ points 60 times, 30+ points 16 times, 40+ points five times and 50+ points once ... Recorded eight double-doubles and one triple-double ... Ranked 12th in the NBA in scoring ... Set the Nets franchise record by scoring 1,911 points, which eclipsed Bernard King by two points ... Tied a career-high and set a franchise record with 23 consecutive 20+ point games from Feb. 27-April 12, 2006 ... Named NBA Eastern Conference Player of the Month for December 2005 after he averaged, 28.6 ppg (.469 FG%, .409 3pt%, .867 FT%), 6.6 rpg, 4.9 apg, 1.3 spg, 0.6 bpg and 37.4 mpg in 14 games (14 starts) ... Led the Nets to a 10-4 record in the month of December, which included an eight-game winning streak to end the month ... For the seventh straight season was named an NBA All-Star ... Top Single-Game Performances: Recorded a double-double with 38 points (15-21 FG, 3-4 3pt, 5-8 FT), 10 rebounds, six assists, four steals and two blocks in a win at Cleveland (12/9/05) ... Scored a career-high tying 51 points (13-25 FG,2-5 3pt, 23-24 FT) and added eight rebounds and four assists as he set the Nets single game records for free throws made and free throws attempted in a win at Miami (12/23/05) ... Posted his lone triple-double of the season as he totaled 28 points (11-24 FG, 0-4 3pt, 6-7 FT), 13 rebounds and 10 assists on vs. Miami (2/4/06). 2006 Playoffs: Averaged 29.6 ppg (.463 FG%, .241 3pt%, .796 FT%), 7.0 rpg, 5.3 apg, 1.8 spg, 0.5 bpg and 40.9 mpg in 11 playoff games (11 starts) ... Scored 20+ in 11 games, 30+ in five games and 40+ in one game ... Recorded two double-doubles ... Top Single-Game Performances: Recorded 34 points (13-24 FG, 1-4 3pt, 7-7 FT), 15 rebounds, seven assists and two steals in a win vs. Indiana (5/2/06) ... Scored 43 (17-34 FG, 3-6 3pt, 6-9 FT) and added six rebounds vs. Miami (5/12/06). Averaged 24.5 ppg (.452 FG%, .406 3pt%, .798 FT%), 5.2 rpg, 4.2 apg, 1.4 spg, 0.6 bpg and 36.7 mpg in 77 games (76 starts) in his seventh NBA season, split between Toronto and New Jersey ... Scored 10+ points 73 times, 20+ points 57 times, 30+ points 24 times and 40+ points five times ... Recorded seven double-doubles ... Ranked eighth in scoring, 17th in three-point field goal percentage and 26th in steals ... Named an NBA All-Star for the sixth time ... Traded by Toronto to New Jersey on Dec. 17, 2004. 2004-05 (Toronto): Averaged 15.9 ppg (.411 FG%, .322 3pt%, .694 FT%), 3.3 rpg, 3.1 apg, 1.3 spg, 0.8 bpg and 30.4 mpg in 20 games (20 starts) for the Raptors ... Top Single-Game Performance: Scored 26 points (12-25 FG, 0-1 3pt, 2-4 FT) and added four rebounds, four assists and two steals vs. Washington (11/28/04). 2004-05 (New Jersey): Averaged 27.5 ppg (.462 FG%, .425 3pt%, .817 FT%), 5.9 rpg, 4.7 apg, 1.5 spg, 0.6 bpg and 38.9 mpg in 57 games (56 starts) for the Nets ... Named NBA Eastern Conference Player of the Month for February after he averaged 30.2 ppg (.444 FG%, .455 3pt%, .900 FT%), 6.3 rpg, 3.8 apg, 1.4 spg, 1.2 bpg and 37.8 mpg in 13 games (13 starts) ... Scored his 10,000th career point and finished the season with 10,989 career points ... Top Single-Game Performances: Totaled 30 points (11-20 FG, 5-5 3pt, 3-4 FT), eight rebounds and 10 assists for his first double-double of the season in a win at Utah (1/29/05) ... Recorded 43 points (14-32 FG, 7-16 3pt, 8-9 FT) for yet another season and tallied 14 boards, five dimes and three blocks in a win vs. Philadelphia (2/7/05) ... Scored a season-high 45 points (18-32 FG, 7-9 3pt, 2-3 FT) to go along with seven rebounds, three assists and four steals in 36 minutes played in a win vs. Boston (4/9/05). 2005 Playoffs: Averaged 26.8 ppg (.365 FG%, .316 3pt%, .861 FT%), 8.5 rpg, 5.8 apg, 2.3 spg and 44.8 mpg in four games (Four starts) in New Jersey’s opening round playoff series against Miami ... Scored 20 or more points four times and 30+ once ... Grabbed 10+ rebounds in two games ... Dished out 10+ assists in one game ... Recorded three double-doubles ... Top Single-Game Postseason Performances: Posted 27 points (8-21 FG, 3-5 3pt, 8-9 FT), 10 rebounds and eight assists at Miami (4/24/05) ... Totaled 36 points (15-37 FG, 2-9 3pt, 4-6 FT), 10 assists, nine rebounds and three steals vs. Miami (4/28/05). Selected to the 1999-2000 All-NBA Third Team after he averaged 25.7 ppg (.465 FG%, .403 3pt%, .791 FT%), 5.8 rpg, 3.9 apg, 1.3 spg, 1.1 bpg and 38.1 mpg in 82 games (82 starts) in his second NBA season ... Scored in double figures in all 82 games played ... Scored 20+ points 63 times, 30+ points 25 times, 40+ points twice and 50+ points once ... Recorded nine double-doubles and one triple-double ... Set the Raptors’ single-season record with 2,107 points, which still withstands to this day ... Ranked fourth in the NBA in scoring, 17th in three-point field goal percentage and 18th in minutes played ... Led all players in scoring for December (27.4 ppg) and February (29.8 ppg) ... Selected to the NBA-All Star game for the first time and was the league’s leading vote-getter ... Finished 10th in the voting for the NBA’s Most Valuable Player ... Hit three last-second shots during the month of March, including a three-pointer at Boston (3/1/00), another three-pointer on at LA Clippers (1/8/00) and a driving dunk vs. Houston (1/19/00) ... Top Single Game-Performances: Scored a career-high tying 51 points (17-32 FG, 4-8 3pt, 13-13 FT) and added nine rebounds and three steals in a win vs. Phoenix (2/27/00) ... Recorded his first career triple-double with 31 points (13-19 FG, 1-3 3pt, 4-6 FT), 11 rebounds and 10 assists in a win vs. Cleveland (4/10/00). 2000 Playoffs: Averaged 19.3 ppg (.300 FG%, .100 3pt%, .871 FT%), 6.0 rpg, 6.3 apg, 1.0 spg, 1.3 bpg and 39.7 mpg in three playoff games (Three starts) ... Top Single-Game Performance: Collected 27 points (7-13 FG, 0-3 3pt, 13-16 FT), seven rebounds and five assists at New York (4/26/00). A unanimous selection to the NBA All-Rookie First Team and named the 1998-99 NBA Rookie of the Year after he averaged 18.3 ppg (.450 FG%, .288 3pt%, .761 FT%), 5.7 rpg, 3.0 apg, 1.1 spg, 1.5 bpg and 35.2 mpg in 50 games (49 starts) ... Scored 10+ points 43 times, 20+ points 23 times and 30+ points three times ... Recorded six double-double ... Placed 21st in scoring ... Ranked 16th in the NBA in blocked shots and led all guards in the category ... Led all rookies in scoring and blocks ... Ranked fourth in rebounding, third in assists, sixth in field goal percentage, ninth in three-point field goal percentage, eighth in free throw percentage, fifth in steals and tied for second in minutes played ... The only rookie in the league to lead his team in scoring ... Named NBA Rookie of the Month for March after he averaged 18.4 ppg (.454 FG%, .261 3pt%, .775 FT%), 6.0 rpg, 2.5 apg, 0.9 spg, 1.4 bpg and 35.3 mpg in 17 games (17 starts) ... Awarded NBA Rookie of the Month for April after he averaged 20.6 ppg (.432 FG%, .304 3pt%, .765 FT%), 5.9 rpg, 4.2 apg, 1.2 spg, 1.6 bpg and 36.7 mpg in 18 games (17 starts) ... Received 113 of the 118 votes (.958), the third-most decisive margin of the 90’s in the Rookie of the Year voting behind Tim Duncan (113 out of 116, .974%) and Shaquille O’Neal (96 out of 98, .980%). 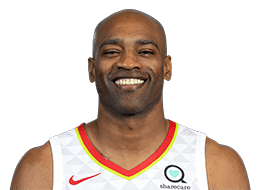 Born Jan. 26, 1977 in Daytona Beach, Fla… Full name is Vincent Lamar Carter… Has one daughter, Kai, born on June 1, 2005 ... Cousin of former NBA All-Star Tracy McGrady… Named one of The Sporting News’ “Good Guys in Sports” in 2004 for his off court activities ... Received the NBA Community Assist Award in July 2005 ... Unveiled a new, pro-sized basketball court funded by his foundation in Toronto’s Dixon Park on July 9, 2003 ... Donated $2.5 million to finance the building of a new gym at his alma mater, Mainland High School in Daytona Beach (named Vince Carter Athletic Center), on Sept. 16, 2002 ... Established the Embassy of Hope Foundation to support causes for children in Florida and Ontario, Canada ... Launched vincecarter15.com in February 2002 ... Received his degree in African-American studies from the University of North Carolina on May 20, 2001... Played host to the Vince Carter Celebrity All-Star Game at Air Canada Centre for four years, raising thousands of dollars for his foundation and drawing consecutive sellout crowds of 19,800 – the largest crowds ever for an NBA-sanctioned charity game ... Named a Goodwill Ambassador by Big Brothers/Big Sisters of America ... Selected to the Parade All-American First Team and USA Today All-USA First Team and named Florida Mr. Basketball as a Mainland High School senior in 1995... Was a drum major in his high school band and played saxophone and baritone ... Received a music scholarship to Bethune-Cookman College.